Hospitality lawyer with pearls from the New York hospitality conference. The mood in New York was more somber in June 2008 than it has been for a long time at hotel conferences. Final attendance was about 2400 (about the same as last year) and for the first time, NYU had fewer conference delegates than the Los Angeles conference in January (3,200 at ALIS in January 2008). Many believe that attendance at these conferences is a good barometer of sentiment in the industry — send more people when times are good, and send fewer when you batten down the hatches for a storm. I had the opportunity to listen to Randy Smith and Mark Lomanno of Smith Travel Research in two sessions this past week — one private session at the Lodging Industry’s think tank (the Lodging Industry Investment Council or LIIC) and in the general opening session at NYU. My commentary includes selected slides from STR, and a link to the full STR presentation can be found at the end of the article. Here is a Hospitality Attorney’s executive summary. What’s Weekday vs. Weekend demand tell us? Whither Lodging Demand, GDP and the Cost of Gasoline? All these segments will be posted shortly, so check back if you don’t see the one that you want. It was only a few months ago that hotel industry pundits speculated that we were only in the 3rd or 4th inning of the good times for the hotel industry’s surge in growth and profits. Now, at least a few revel in predicting looming bankruptcies, receiverships and workouts. Please note that I have inserted selected slides from the STR presentation below, and the full STR slideshow is available with the link at the very end of this article. One recurrent theme was the strength of international markets, and their seemingly unlimited future potential. As economies grow, so does the need for hotels. Developers, brands and capital are all scrambling to provide these communities with desperately needed hotels. For example, at Bjorn Hanson’s luncheon panel of economists, David Wyss, Chief Economist, Standard & Poor’s, presented this graphic illustration to show how the world’s economy is driven today. While the old saying was, that “When the U.S. sneezes, the world catches a cold,” David suggests that is no longer true. The new paradigm is that there are many locomotives (other than the U.S.) pulling the train of the world’s economic activity. This has both benefits and challenges for the U.S. 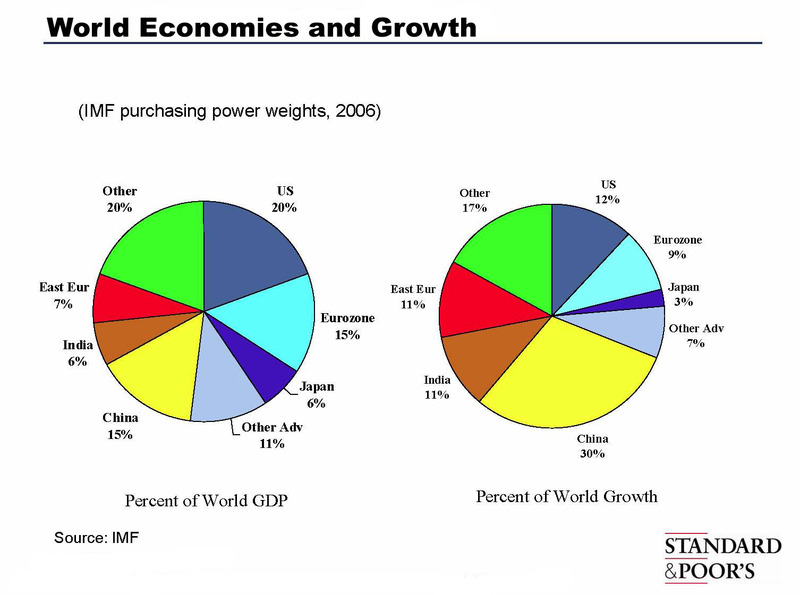 The following chart supports David’s thesis that many rising economies rival the U.S., and shows where the growth is coming from. Look at Asia! 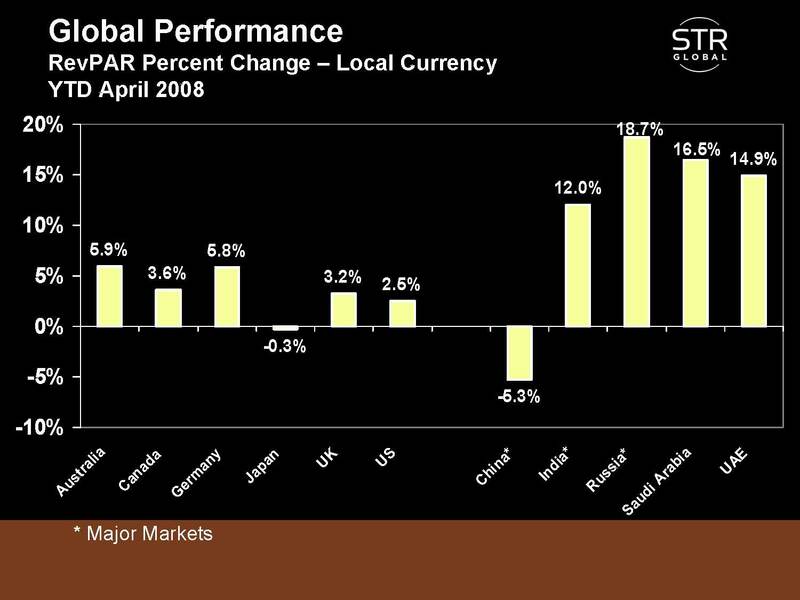 These first three slides from Smith Travel Research show how occupancies, ADRs in local currencies, and RevPARs in local currencies compare among a number of major hotel markets. You will notice that the more established markets are on the left side of the chart (The U.S., United Kingdom, Japan) and the emerging hotel markets are on the right (places like China, India, Russia, Saudi Arabia and the UAE). 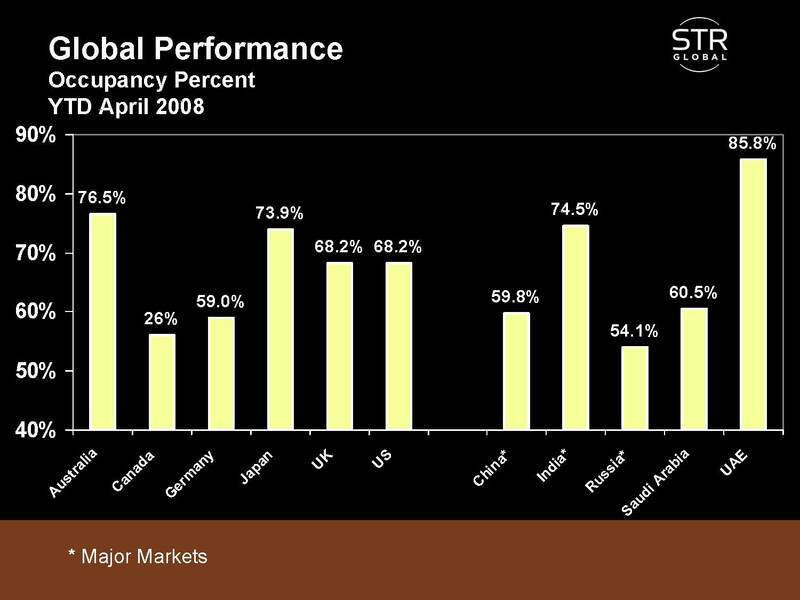 These charts show that most of the performance in the emerging hotel markets is not coming from occupancy but from rate, which is driving RevPAR, and these economies are showing significantly higher RevPAR growth than the more mature hotel markets like the U.S. and United Kingdom. No wonder hoteliers like Bill Marriott and Barry Sternlicht expressed their excitement about international markets throughout the conference! 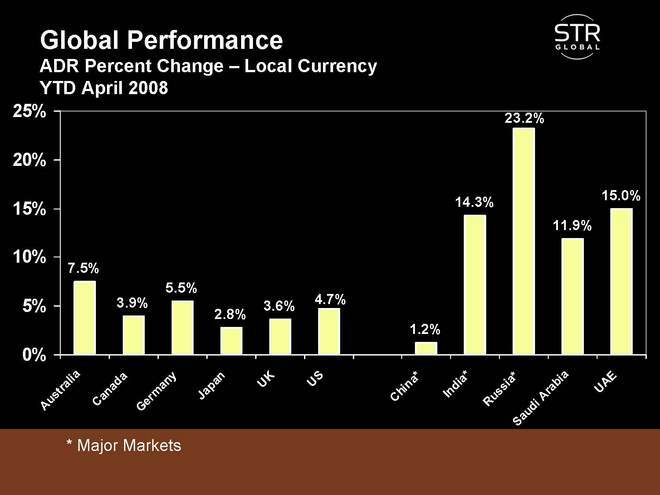 Link to STR’s full slide show at NYU Hotel Investment Conference 2008. My take on the data is above. Here is the link to the full unadorned slide show as presented by Randy Smith of Smith Travel Research on June 2, 2008. STR 2008 Data.